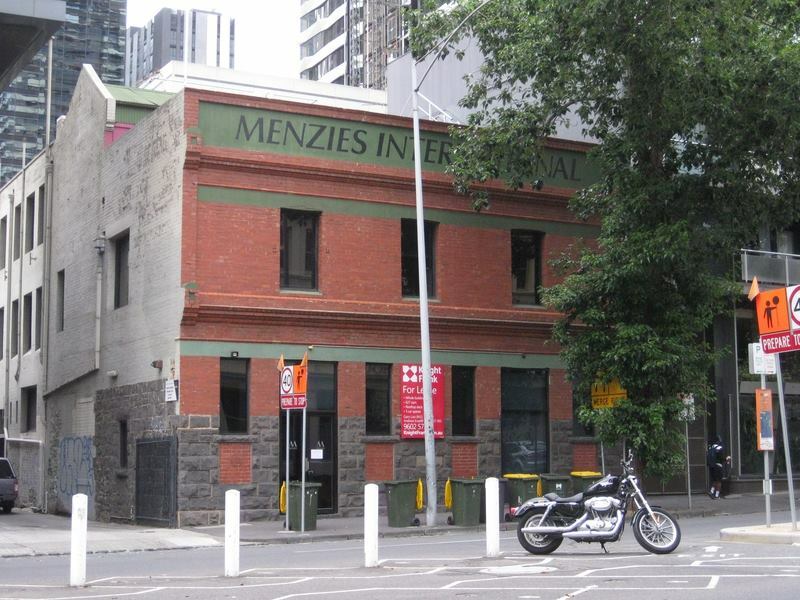 The Royal Saxon Hotel at 441 Elizabeth Street was built 1858, over the past few years this important historic building has been under threat more than once. 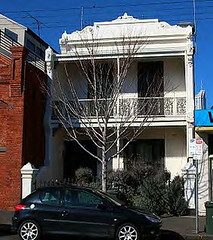 Royal Saxon Hotel 1858 in 2012. Brick facade painted, and ground level altered. The stone section is part of the site, and will also be retained. 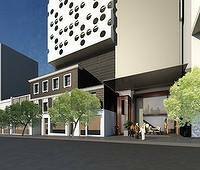 In 2012 there was a proposal to facade the hotel and construct a large tower behind that would have only had a 6 metre setback from the street. This is one of the only proposals the former planning minister rejected. Proposal from 2012 with only facade and 6m depth of side wall kept, and tower plonked right on top. New plans keep the entire 1858 section, restore the facade (as it is seen below in a c1950 image) and the tower would be set back 12 metres, (the design involves a bit of cantilevering over the rear). 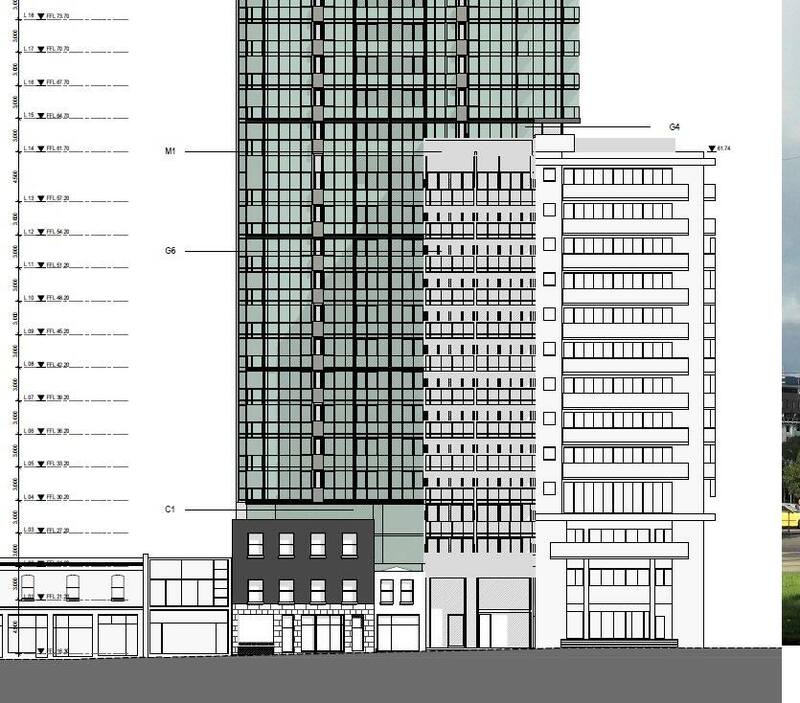 The only problem is that the new design includes a proposal to facade a nice 1850s/1900s building on Franklin Street for a 12 storey wing of the tower with only minimal setbacks. 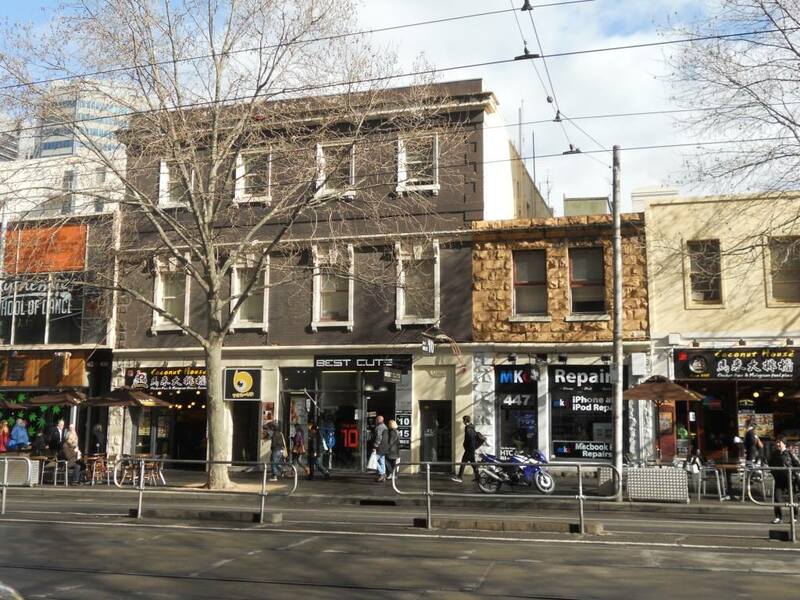 This building is about to be given heritage protection as part of the city north heritage review. MHA strongly opposes keeping only a sliver of a building. This is never a satisfactory outcome for heritage as it goes against the principle that a building is always more than its exterior walls. 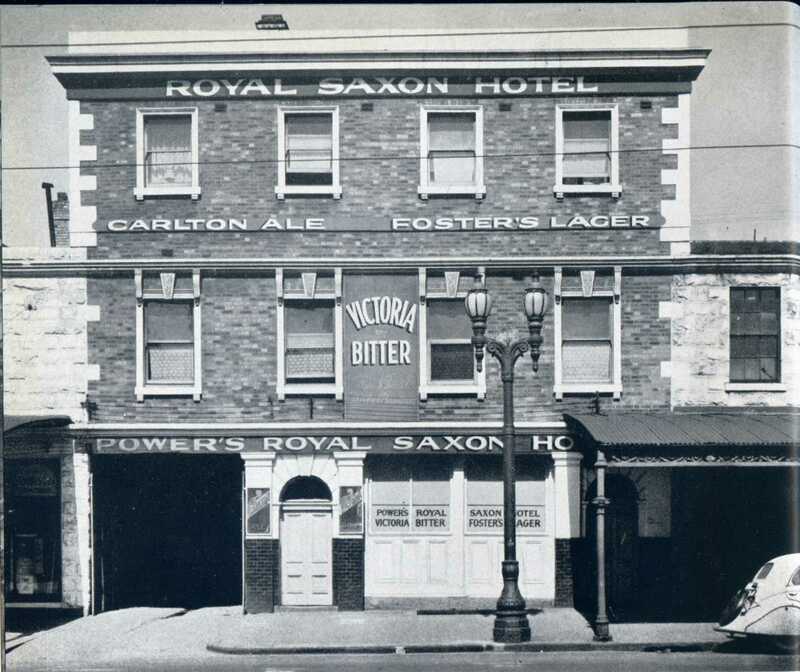 Royal Saxon Hotel 1858 in c1950 showing brick facade and what was probably original ground level. We have lodged a submission praising the first part, but opposing the second. Building at 139-141 Franklin Street, ground level possibly 1850s, upper level c1900. Only the three outside walls would be kept. New proposal. The green tower setback 12m, though there is a 12 storey wing in grey replacing altered victorian shops on the right jutting forward. Prefer that was setback a bit. 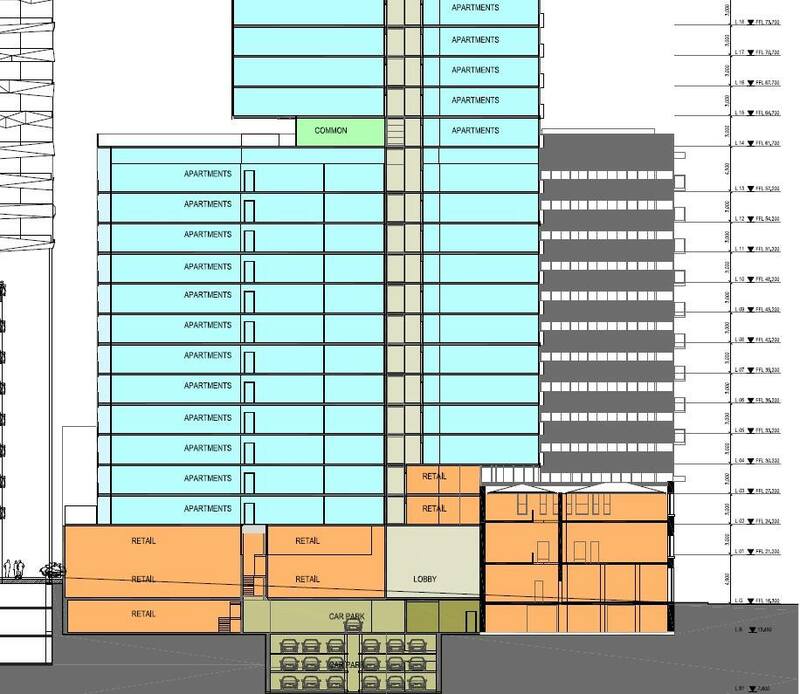 New proposal showing section though retained hotel building (orange part on the lower right) and 4m cantilever over the rear part of the main tower. Another short-sighted value-less decision by the relevant planning authorites. 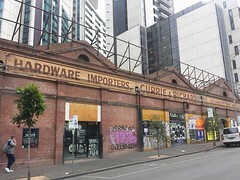 Mature cities (London, Paris, New York, et al) do not allow developers to bulldoze their heritage. Perhaps we are not as sophisticated as we like to project?